Smoking increases cardiovascular risk by promoting platelet aggregation and consequent thrombus formation. It also directly affects metabolism of several medications and dose adjustment may be necessary depending on the amount smoked. Cessation of smoking leads to relatively quick reduction in the excess cardiovascular risk with a rapid reduction of the pro-thrombotic state occurring within weeks of quitting. [#benowitz-nl.-2003] For those who smoke 20 or more cigarettes per day, the excess risk of acute MI is halved after 3-5 years of quitting. Nicotine is the addictive component of tobacco products, but it does NOT cause the ill health effects of tobacco use. Managing nicotine dependence requires an understanding of physiology. Nicotine is a short acting substance (half-life approximately 40-120mins), with the major metabolite being cotinine. Due to genetic variation, some individuals metabolise nicotine faster than others. Fast metabolisers tend to be more addicted, smoke more and have a higher risk of lung cancer. In general, nicotine withdrawal symptoms manifest within the first 1–2 days, peak within the first week, and gradually subside over the next 2–4 weeks. [#hughes-jr.-2007] Strong cravings for tobacco may persist for months to years after cessation. [#benowitz-nl.-1992] These cravings typically are psychologically motivated, not physiologic, and can be ameliorated using cognitive or behavioural coping strategies. Sometimes a simple change of surroundings can help alleviate cravings, such as leaving the office to step outside for a breath of fresh air, or taking a quick walk up a flight or two of stairs to get some exercise. To alleviate the symptoms of withdrawal, smokers re-dose themselves throughout the day. The figure below depicts the typical nicotine addiction cycle a cigarette smoker experiences on a daily basis. The jagged line represents venous plasma concentrations of nicotine as a cigarette is smoked every 40 minutes from 8 am to 9 pm. The upper solid line indicates the threshold concentration for nicotine to produce pleasure or arousal. The lower solid line indicates the concentrations at which symptoms of withdrawal from nicotine occur. The shaded area represents the zone of nicotine concentrations (neutral zone) in which the smoker is comfortable without experiencing either pleasure/arousal or abstinence symptoms. See also comprehensive guidelines such as the Supporting smoking cessation: A guide for health professionals. Systematically identify all tobacco users at every visit. Assessment should determine smoking history, readiness to quit and level of dependence. 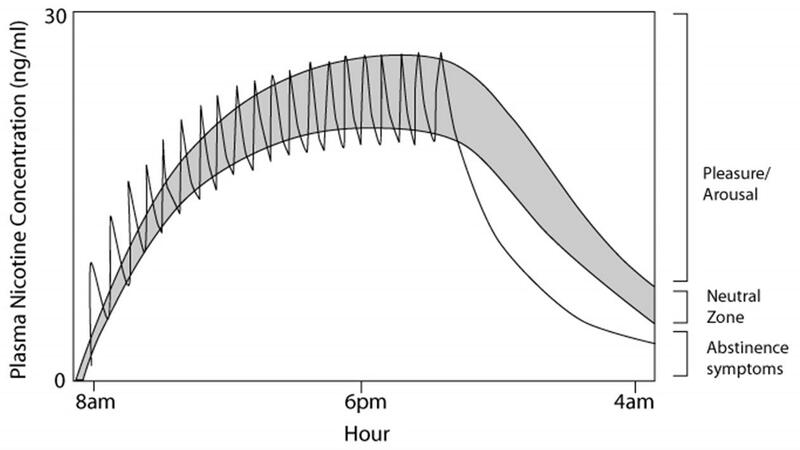 Time to first cigarette (TTFC) indicates how soon after waking the patient has their first cigarette and is associated with nicotine dependence. Note that number of cigarettes smoked per day is less relevant as patients frequently compensate for fewer cigarettes by inhaling more deeply. See the Fagerström test for nicotine dependence for more information. 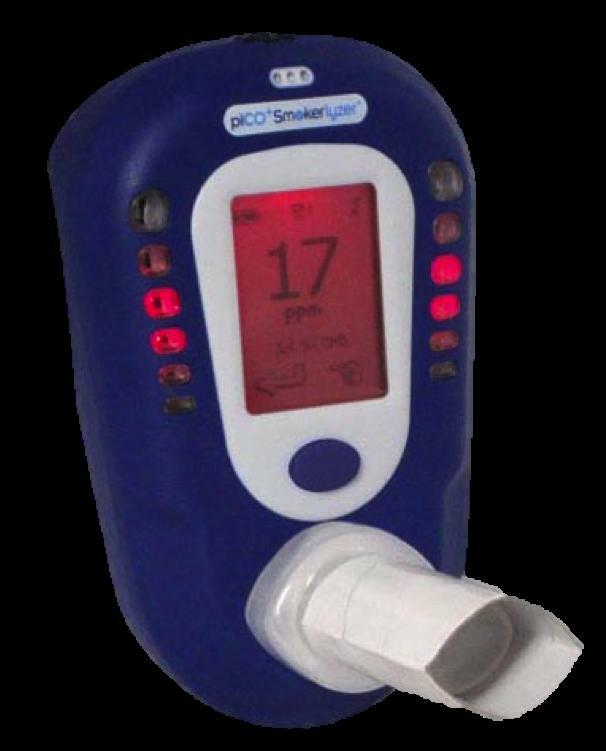 Expired carbon monoxide measures can be obtained using a carbon monoxide meter (see image below). Smokers should be strongly advised to quit and at the very least, should be actively encouraged to consider quitting. The message should be clear and strong, delivered without judgment, and should be personalized and sensitive. Tone and manner should convey a concern for the patient’s well-being as well as a commitment to help them quit, when they are ready. Another useful approach is to personalize the message by linking tobacco use to current health or illness; its social and economic costs; the patient’s motivation level and readiness to quit; or the impact of tobacco use on children, or others in the household. Using a genuine and sensitive approach that acknowledges the difficulty of what is being requested, the clinician is more likely to move the patient forward in the process of preparing to quit. After advising the patient to quit, the next step is to assess the patient’s readiness, or willingness, to try to quit. The number of previous attempts to cease, methods used and level of success. Readiness to cease. The Behaviour change section provides a range of tools to assess readiness to change. When is the person considering quitting or have they already quit? Management should be determined by the patients’ readiness to try to quit and should be tailored to individual needs. A patient who recently quit (i.e., in the past 6 months) requires continued support and encouragement, and reminders regarding the need to abstain from all tobacco use—even a puff. A patient who has been off of tobacco for more than 6 months typically is relatively stable but often needs to be reminded to remain vigilant for potential triggers for relapse. The Smoking cessation guidelines algorithm provides an overview of the recommended approach to smoking cessation. See Nicotine dependence for more information on the physiological basis of NRT. The table below summarises the pharmacological approach to smoking cessation. Multiple patient contacts are associated with higher quit rates. Even brief interventions (1–3 minutes) can increase patients’ odds of quitting. There is no recommended best approach for spacing the counselling sessions (i.e., the number of days or weeks over which treatment is spread) but in general follow-up contact should be scheduled within the first week after the quit date. The next follow-up is recommended within the first month with additional contact scheduled as indicated. During the follow-up contacts, key dates should be documented (e.g., quit dates, tobacco-free anniversaries) and important milestones acknowledged. Patients should be congratulated for their success. If tobacco use has occurred, the circumstances should be reviewed and a commitment sought to return to total abstinence. The patient should be reminded that lapses (slips) occur as part of the normal learning process and should be viewed as such. Pharmacotherapy use should be assessed, including compliance and side effects experienced. When appropriate, referral to more intensive treatment should be considered. In the absence of time or expertise, clinicians should, at a minimum ask patients about tobacco use, advise them to quit, and provide information about other resources for quitting, e.g., Quitnow. Referral should be made to those with specialist experience such as the Quitline, smoking cessation specialist or a local cessation program. As with recent quitters, clinicians must evaluate the status of the quit attempt. Has the patient had any strong temptations to use tobacco, or any occasional use of tobacco products (even a puff)? Patients might be particularly vulnerable to relapse during times of extreme stress. Also, it is important to ensure that patients are appropriately terminating or tapering off pharmacotherapy products. Relapse prevention strategies should be discussed as needed, and healthy behaviours should be encouraged, i.e., ones that the patient does not associate with tobacco use such as exercise, hobbies (particularly ones that involve use of the hands), and going to movies with friends. To reduce weight gain which often occurs after quitting, especially in women, it is important for patients to maintain a healthy diet. Patients who have stayed off tobacco for 6 or more months should be congratulated for their enormous success. Remaining tobacco-free is a continuous process of learning how to cope with this change. Clinicians should acknowledge, reward, and reinforce the patient’s triumphs in the face of this challenge and continue to assist patients throughout the quit attempt. Behavioural change is a process, not a single step. It is not uncommon for patients to experience at least one relapse episode. This should not be regarded as a failure on the part of the patient or the provider, but rather one of the many possible steps within the process of establishing long-term change. Some experts advocate vaping (e-cigarettes) as a form of tobacco harm reduction. However there is a need for high quality research to establish the long term safety and efficacy of these devices[#national-health-and-medical-research-council]. As the safety of vaping is not yet established, first line therapy for tobacco harm reduction should include nicotine replacement therapy (NRT) in the form of nicotine patches, gum, lozenges, and inhalors; and non-NRT (varenicline and bupropion) which have been evaluated for quality, safety and performance. The availability and legality of nicotine vaping varies in different jurisdictions internationally. Benowitz NL. Cigarette smoking and cardiovascular disease: pathophysiology and implications for treatment. Prog Cardiovasc Dis 2003;46:91-111. Mendelsohn C. Smoking and cardiovascular disease. Cardiology Today 2013;3: 23-25. Benowitz NL. Cigarette smoking and nicotine addiction.Med Clin N Am1992;76: 415-437. National Institute for Health and Care Excellence (NICE) 2013. Tobacco: harm-reduction approaches to smoking. NICE public health guidance 45. The Royal Australian College of General Practitioners. Supporting smoking cessation: a guide for health professionals.Melbourne: The Royal Australian College of General Practitioners, 2011[Updated July 2014]. Gilpin, E. A., White, M. M., Farkas, A. J., & Pierce, J. P. (1999). Home smoking restrictions: which smokers have them and how they are associated with smoking behavior. Nicotine & Tobacco Research, 1(2), 153-162. Swanson, J. A., Lee, J. W., & Hopp, J. W. (1994). Caffeine and nicotine: a review of their joint use and possible interactive effects in tobacco withdrawal. Addictive Behaviors, 19(3), 229-256. Garvey, A. J., Bliss, R. E., Hitchcock, J. L., Heinold, J. W., & Rosner, B. (1992). Predictors of smoking relapse among self-quitters: a report from the Normative Aging Study. Addictive Behaviors, 17(4), 367-377. Schneider NG, Olmstead RE, Franzon MA, et al. The nicotine inhaler. Clinical pharmacokinetics and comparison with other nicotine treatments. Clin Pharmacokinet2001;40:661–684. National Health and Medical Research Council. NHMRC CEO Statement: Electronic Cigarettes (E-cigarettes).